Hans Christian Andersen is one of the most famous fairy tales writers, but his own life story is not one you will be told before going to bed. In Danish history, the most famous two geniuses lived in Copenhagen at the same period: Christian Andersen and Søren Kierkegaard. 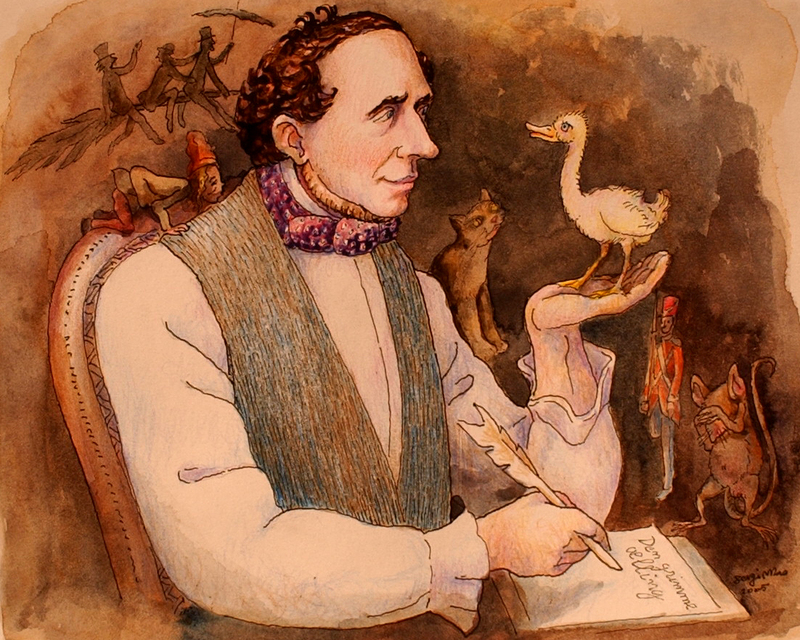 For many people, Andersen is a writer who wrote fairy tales for children. However, Andersen himself was never satisfied with that. He did not want to be a fairy tale writer only; he wanted to be a world famous author. Andersen became famous in 1835 at his 30s. He accomplished 156 fairy tales, 1000 poems, 6 novels, 3 autobiographies, several travel books and lots of letters and diaries. Dan Ringgaard is an Associate professor of Aarhus University and an admirer of Andersen himself. He spoke with In-sight out about the romantic icon of fairy tales and compares him with the Grimm brothers. L: There are two kinds of fairy tales: One is the original that passes on from generation to generation, and the other is written by romantic authors. How would you compare Grimm brothers and Andersen in this regard? D: Grimm Brothers didn’t create stories. They collected stories. You had the same kind of people collecting fairy tales in Denmark, Norway, and also in France, Italy, all over Europe. So The Grimm brothers were the most famous among those who collected stories, whereas Andersen is the most famous among those who actually wrote new fairy tales. Sometimes he used some of Grimm brothers’ fairy tales in his own words and changed them somehow. L: How about their writing styles? D: The Grimm brothers’ stories are more simple somehow. It doesn’t mean they are not good. But the structures are more simple, the language is more straightforward. Whereas Andersen’s fairy tales are more elaborated, strange or more adapted to new ways of thinking. In many of Andersen’s fairy tales you see romantic ideas. And these would be harder to find in Grimm’s stories. L: Did Andersen have a certain writing pattern? Could you compare that to the Grimm brothers? D: Yes. I mean, you might say at least that it’s very oral. You had pretty straightforward sentences, you had a lot of word play, a lot of irony, and you never find irony in Grimm Brothers’. This shows part of his time, he’s a romantic poet, while Grimm brothers were trying to be scientific. L: There is a double vision in Andersen’s fairy tales, namely children and adults have different understanding of his stories. Do you believe he was aware of that? D: Oh yes. He’s very conscious about it. No doubt when he started out, he might have thought: “alright, it could be fun to write a couple of pieces for children”. But he realized very quickly that he was doing something far more than that. He has the ambition that his literature had to be great art, and at the same time he liked to write these simple stories that would be entertaining. He intuitively knew that by writing these simple childish stories he was actually making great art. This is his talent. D: He didn’t want to educate at all. On the contrary, his aim was to be fun and natural. The mainstream idea is usually that adults wknow better than kids and so, have to educate them. But in Andersen’s romantic intuition child were the clever ones. So there is no didactics. There’s a wish to entertain, to tell great stories, and there’s a wish to make great art. Even at that times, there was a lot of children’s literature extremely educational. Andersen’s definitely isn’t. L: In terms of recognition there are two kind of artists, those who achieve it during life and those who die waiting for it? Is Andersen’s story one with a happy ending? D: Not really. That was his problem. Actually he looked upon being a great artist, but not many regarded him as such while he was alive. So he was having this continuous problem. And in the end he became famous because of his novels, not because of his fairy tales. L: But nowadays people know Andersen as a fairy tale writer. And a great one. Why do you think he would not be regarded as such? D: It is not a sudden change. It happened during his lifetime. His fairy tales became more popular and regarded as important. It has something to do with a literarian thing… Once you look upon on something for children, you sort of go blind to the rest of it. While novels, real genres, the serious ones… that’s usually where you judge an author. And you tend to ignore the minor genre even though fairy tale writing is popular. It was a minor genre and it was a children genre to some extent. This is still a heritage, even now. Especially outside of Denmark. But even in Denmark, he is still regarded not as a big writer, but as a children’s writer and this is a paradox if you consider his fame still grounds on the fact that he was read all over the world to children. L: Does the double vision in Andersen’s fairy tale contradict each other sometimes? Or are they harmonious? D: It depends on the lens, because sometimes he makes these harmonious endings like in Snow Queen. But, still, there is skepticism somehow. You just know he was not telling the truth. The flower actually must die. So even though it is a beautiful story that ends well, there is some kind of consciousness, or reflectiveness that says something’s quite odd here. So there is always a gap, a kind of split. That double vision never really fits; which makes it more interesting. L: In the whole literature history, are there any followers of Andersen? D: In Danish literature, no one continues to write fairly tales, Danish literature is a literature of prose and poetry. It is not a literature with a lot of novels, great Danish writers are actually writing short piece – prose. And I think that is a heritage from Andersen, also writing in this unrhetorical oral language. The genre of writing fairy tales dies with him more or less. L: Do Danish kids still read Andersen today? D: No, as I said the language is too complicated. It’s difficult for them to understand. If you just read them out loud, the language is difficult for them. He’s not really that important, he is becoming one of the brands for the nation. But he is definitely less read than ever. L: But in China, we start to read Andersen at a very early age. It’s even better known than many Chinese folk stories for kids. D: In translation you can modernize it. In Chinese, you can just change Andersen to modern Chinese. But in Danish it’s very hard to modernize the original. It feels wrong somehow. So we hesitate to do that. So quite often the version we have is the original one and that makes it hard to understand. So in some senses, it’s more difficult for us to understand Andersen than anyone others who have a modern translation. L: Do you teach Andersen’s fairy tales in the Scandinavian literature department at the University? D: Yes, we do, because on that level he is extremely important. If you have to take a bachelor degree in Scandinavian literature, you’d probably make a big exam in some of Andersen’s fairy tales. On that level it’s not difficult to understand Andersen. Together with Kierkegaard, he is the major author of Danish romanticism, and mainly Scandinavian romanticism as well.